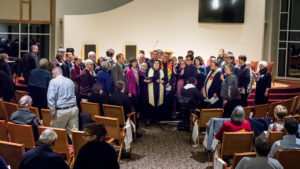 We are frequently asked if Unitarian Universalists have “sacraments” as many other faiths do. In keeping with our belief in the “prophet hood of all believers” we do not have sacraments, per se, where a clergyperson acts as a conduit to a sacred experience. We do, however, have several recurring rituals which are joyful celebrations of this community’s life together. At the beginning of each program year in September, we gather in a single service for all ages and share a much-appreciated ritual that honors the diversity of experiences we have enjoyed in the preceding summer months. We always leave this service with joy and gratitude for the beloved community that is ours. Annually we celebrate the darkness and the promise of the Winter Solstice. Included in this service is time for silence as well as time for joyful noise. Our traditional family Christmas Eve services celebrate the story of Jesus’ birth. All services include traditional readings, carols, and candle-lighting. We hold an annual Flower Communion service each May. This celebration was originated in 1923 by Dr. Norbert Capek, founder of the modern Unitarian movement in Czechoslovakia. As they did in Prague, on the last weekend before the summer program schedule, we participate in this colorful ritual by exchanging flowers with one another, giving concrete expression to the humanity-affirming principles of our liberal faith. We are also hallowing the memory of one of the martyrs of our faith. When the Nazis took control of Prague in 1940, they found Dr. Capek’s gospel of the inherent worth and beauty of every human person to be-as Nazi court records show– “…too dangerous to the Reich [for him] to be allowed to live.” Dr. Capek was sent to Dachau, where he was killed the next year during a Nazi “medical experiment.” This gentle man suffered a cruel death, but his message of human hope and decency lives on through his Flower Communion, which is widely celebrated among Unitarian Universalists today. It is a noble and meaning-filled ritual, which helps us remember the principles and dreams for which he died. There is no joy quite like that of celebrating a child’s entrance into a family. Many families choose to participate in a public ritual where the Fellowship community officially welcomes the child and where the naming of the child is uplifted. Most often, these Dedication ceremonies are conducted during our regular weekend services with sponsors and extended family present. In accordance with our beliefs, each ceremony is tailored to match the family’s spiritual values and hopes for the child. 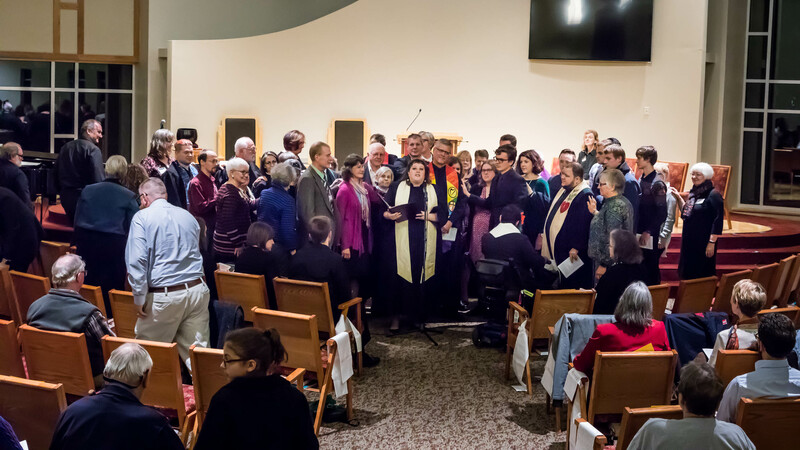 This link provides more detail on the Unitarian Universalist Child Dedication traditions. Memorial Services and funerals are an important way to say goodbye to loved ones. These are planned by the family members and officiant to honor the memory of the person who is deceased.